The roses are in bloom, both the wild varieties that grow in northern Wisconsin and the bushes that were planted in the backyard decades ago. Instead of being a normal person and letting them grow, I decided to make rosewater. Making rosewater is most easily done by simmering rose petals in distilled water for 20-30 minutes, but that type of rosewater will not keep for much more than a week. By making a hydrosol (or steam distillation) of the rose petals, you can make something that will keep for several months in the refrigerator. Oh yes. That means we are going to make a still. Instead of simmering the petals, they are instead heated gently and the resulting steam is trapped in a bowl. The steam (condensation) is our hydrosol. This sounds very confusing, but it isn’t! Promise! *Though they don’t have the benefits of roses, I also threw in some peony petals and mock orange petals, mostly just because they smell so good. But the bulk should be rose petals. Ready a water-bath canner or large stockpot. Turn the canning rack upside down inside the pot. Set a heatproof bowl on top. This is what will catch the steam. Use enough water to submerge the petals. I used 2-3 cups. Put the lid on the canner upside down. This way, when the steam collects inside the pot, it will have an easier time gathering on the underside of the lid and dripping into the center bowl. Now, you can let the petals sit in the water for awhile if you like, with no heat, or you can jump into the actual distillation. Turn the heat to medium-low. I let this go for a few minutes until I felt like the water was heating up. Once steam started rising from the water, I turned the heat to low and added a handful of ice cubes on top of the lid to help the condensation process. Try not to boil the water inside the pot. You just want the water hot enough to steam. A light simmer is probably not the end of the world, but try not to boil the heck out of everything. Set a timer for 30 minutes. If the ice melts, add more. When the 30 minutes is up, turn off the heat and let the pot sit for 10-15 minutes. Remove the lid, and there you have it. A hydrosol, or rosewater distillation. Pour the mixture into a sterilized bottle. Dark glass is best, it helps prevent light from breaking down the distillation. The petals can go into the compost. And that’s that! Store this in the fridge. It will keep for several months at least. If you want it to last longer, a few drops of pure grain alcohol or vodka can be added, but that will have a drying effect on the skin if you decide to use it as a toner. So what the heck do you use rosewater for? 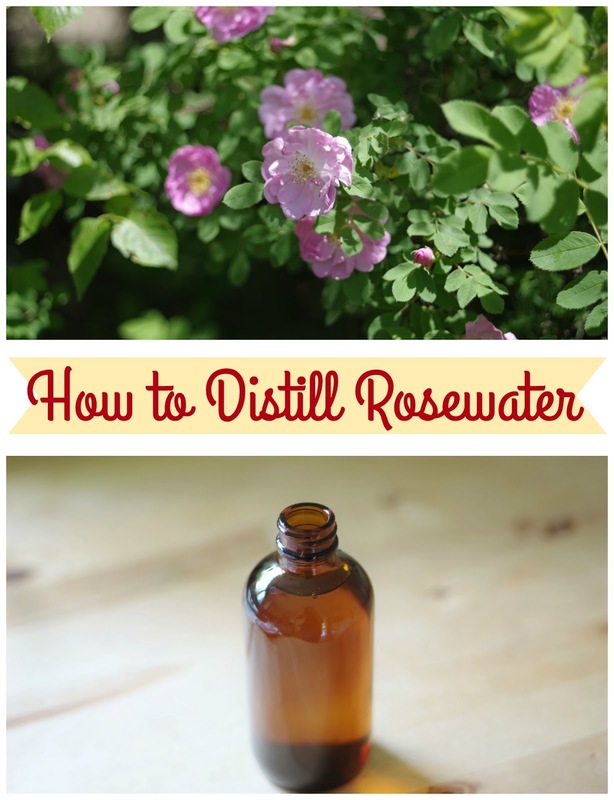 Rosewater is an excellent facial toner, can be added to bathwater, is a good facial mist, can be used a room spray, and is also good for the hair. Go forth and build a still in your kitchen.